I worked in the Bank One Center, now Chase Tower, in the '90s, and to me the most fascinating thing about that building is that it was always 73 degrees inside. It was a space ship to me. I loved that building, and it still fascinates me. I don't go back there often nowadays, but I have occasionally, and if you get a chance, it's worth a look. It was built in 1972, and has been beautifully cared for, and mostly successfully unimproved, since then. It's on the northeast corner of Central and Monroe. No, you can't go up in the elevators, but you can go inside on floor level, and then downstairs, which is an amazing space. It really does feel like a space ship once you're inside. Even the signage was the font that was used in movies in the 1960s that was supposed to show what the future would look like, called Microgramma. The building was self-contained. It had its own shops, post office, dry cleaners. There was a cafeteria, called The Coin Room, and a little nonsense store where you could buy small necessities, like Kit-Kat bars. I remember a florist, and I'm sure there were other things that I've long forgotten. You parked in the garage that was just east of the building, and walked through an underground tunnel, which went under 1st Street, to the tower. I worked on the 31st floor, and really, there was no reason to go outside, although sometimes I did, when it wasn't too hot outside. I usually brought my lunch, which I ate in ten minutes, and it gave me the rest of the lunch hour to explore. And I explored that building! Aside from its interesting architecture, every floor had original artwork, and sculpture. The art collection had been started by Walter Bimson, who had been president of Valley Bank in the 1930s, and it was a gigantic collection by the 1990s, when Bank One took it over. 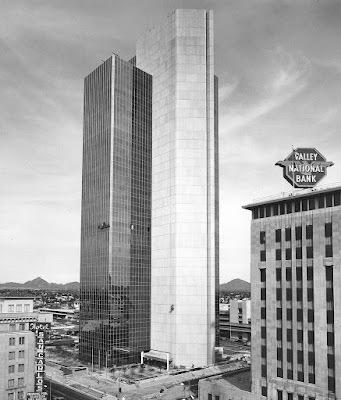 Not only did every branch in Arizona have original art on its walls, and sculpture, the all of the floors of Bank One Center did, too. There was a full-time curator who worked for Bank One, and even with all of that space to display the artwork, a lot of it was just kept in storage. By the way, the very best stuff was on the executive floor, which I visited when I could. The art collection still belongs to JP Morgan Chase, and the most valuable pieces are now in Manhattan. I'm glad I got a chance to see them before they moved away. Being of a techno-nerdy mindset, I accepted the invitation one day, which went out to all employees, to see the new air conditioners after they had been installed. No, I'm no expert on air conditioners, but man, you should see how BIG the A/C has to be for a gigantic space ship in Phoenix! And during the tour, I learned that the goal of the engineers was to keep the interior of that building 73 degrees, summer and winter. And to this day I remember that the temperature inside of a building is the one thing that everyone always agrees on - it's always wrong. 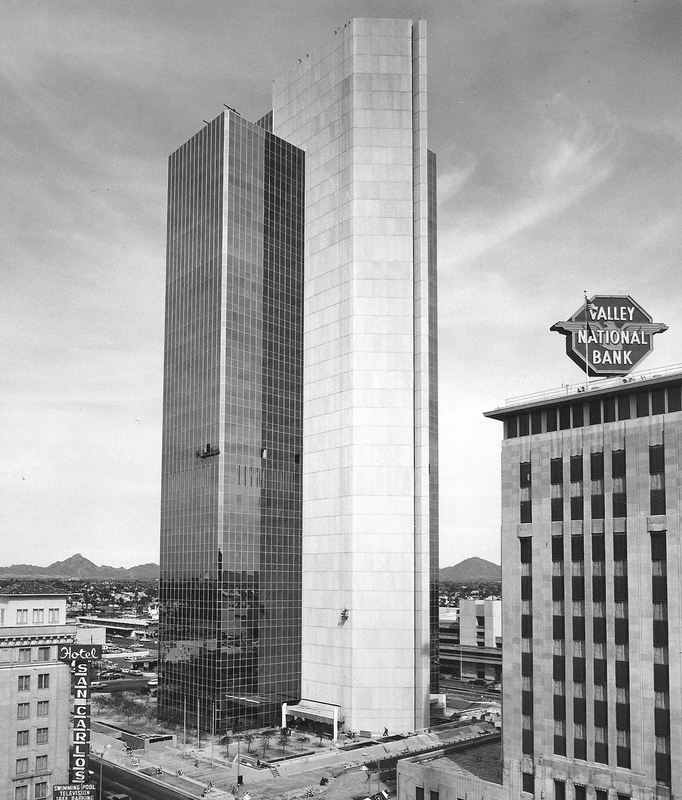 Photo of the construction of Valley Center in 1972 by Robert Markow. Used here with permission by his son Paul.